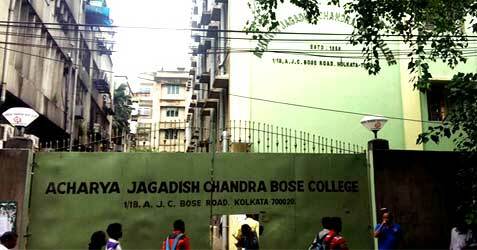 The college Acharya Jagadish Chandra Bose College was established and can possibly be traced back to the year 1968, when the Calcutta University approved the affiliation of the twine institutions with the name of Birla College of Science and Birla College of Education simultaneously bearing the address, 2 Moira Street, Calcutta–700017 being established and organized by the then trustee of Vidya Mandir Society and Junior Hindi School under the control of the Birla Group were amalgamated into one single college in the year 1969 under the name of Birla College of Science and Education. Late Prof. Shambhu Ghosh the Minister-in-Charge of Higher Education of Government of West Bengal was given authority of college by Birla Management some time of August, 1978. For converting the college as a Government College in pursuit of the Governments deal, the Calcutta University appointed Prof. S. R. Das as the college administrator on May 19, 1979 and took over the college management and a bill was raised before the legislative assemble for permanently converting it to Government College by taking over the management of the college. The history of development of the college with its original base at Vidya Mandir Society and Junior Hindi High School ruled by the Birla Group, demands salute and thanks from all corners of the society. The long standing battle was only fought by the unified synchronizing of thoughts and effort of the Acharya Jagadish Chandra Bose College teaching staff and the employees with the constant impetus and interest of the Higher Education Department, Government of West Bengal.